Starburst galaxies are galaxies that are in the process of creating massive formations of stars. This type of galaxy emits large amounts of infrared light created by the explosions that happen during the formation of stars. 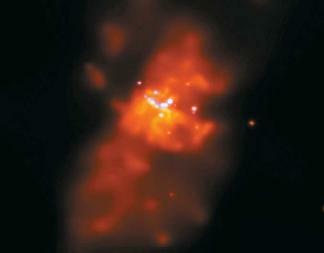 Starburst galaxies were first identified by this incredible amount of infrared light. Infrared light is the portion of the electromagnetic spectrum with wavelengths slightly longer than optical light that takes the form of heat. with another galaxy that starts a chain reaction. The impact of such a collision produces shock waves throughout the galaxy that push on vast clouds of interstellar dust and gas that are present. These shock waves in turn cause the clouds to collapse and produce short-lived, massive stars. The stars that form from this collision quickly use up their nuclear fuel and explode in a supernova (an extremely bright new star). This explosion produces yet more shock waves and consequently more star formations. The formation of a starburst galaxy ends when its giant clouds of gas are used up or pushed too far away due to the explosions. Starburst galaxies often emit three-quarters of their light in the form of infrared light. During the formation of stars, the large clouds of gas and dust that the stars form in heat up and the dust emits infrared light, which is able to get through the clouds of gas. But because the light that comes through is infrared, starburst galaxies are relatively unspectacular when viewed through a regular telescope. However, an infrared telescope (a telescope that allows the user to see the usually invisible infrared wavelengths) shows starburst galaxies standing out from all other galaxies because of their brightness from the continuing formation of stars. Galaxy: A large collection of stars and clusters of stars containing anywhere from a few million to a few trillion stars. Infrared light: Portion of the electromagnetic spectrum with wavelengths slightly longer than optical light that takes the form of heat. Milky Way: The galaxy in which our solar system is located. Starburst galaxies most often appear irregularly shaped when compared to regular galaxies. Most galaxies are spiral or elliptical in shape. For instance, both the Milky Way galaxy (our galaxy that includes a few hundred billion stars, the Sun, and our solar system) and the Andromeda galaxy (the nearest galaxy similar in size to the Milky Way, located 2.2 million light-years away) are spiral-shaped. Astronomers believe that the irregular shape of starburst galaxies is due to their collision or near-collision with other galaxies. Because the study of infrared radiation is limited from Earth's surface (water and carbon dioxide in Earth's atmosphere block most of it), astronomers had a limited knowledge of starburst galaxies. This changed when an infrared telescope was mounted onto a satellite observatory that was sent into space in 1983. Three countries—the United States, England, and the Netherlands—combined their efforts to develop and launch the Infrared Astronomical Satellite (IRAS). The IRAS was equipped with an infrared telescope that observed, among other things, that thousands of starburst galaxies exist in space. It also showed that starburst galaxies consist of nearly one-third of the energy in the universe, suggesting that starburst galaxies are the main source of new stars. Another high-tech space observatory was launched in 1990. The Hubble Space Telescope (HST) was sent into space and acted as an observatory for astronomers from dozens of countries. With its high-resolution camera sending back sharp pictures to Earth, the HST showed that violent star formations—typically thought to occur only in distant galaxies—also occurred in the closest starburst galaxy (about 1,000 light-years from Earth). The HST also confirmed the theory that stars are often born in dense clusters (close groupings) within starburst galaxies.